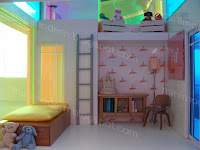 The platform/futon bed is a combination of Voila Toys and parts of a Dolls House Emporium bookcase. The chair is from Reac Japan; the sideboard/bookcase is from the Dolls House Emporium (Mackintosh collection) and the lamp is from AG Minis. All of the accessories are from Re-Ment, AG Minis and Bozart Toys. I feel like such a fool letting the dolls in this scene make me feel sad. What happened? Did they lose a child?? I notice the phone in the man's hand. They must have received bad news. Maybe an adoption process isn't going through?? Whatever. Brilliant! Who manufactures these dolls? They are terrific. Best I have seen. Yet again another great post. I can't take credit for the wallpaper--it came with the Kaleidoscope House.